Fear is powerful. It can cripple you when, in all honestly, there's probably little you should actually fear. When I was growing up, I would constantly see my mom afraid of dogs – it rubbed off on me, and for a long time I was afraid, too. Luckily, I slowly got used to them and conquered that fear. I've conquered fear in real life, so for my VR diary this week I wanted to see if virtual reality could help me conquer my fears as effectively. After all, the point of this diary is to see whether VR is good enough to replace its real equivalent. In this week's case, could VR actually be as helpful as going to a therapist and seeking help about my fears? Virtual reality is an immersive technology; its promise is to transport you to world and experiences you otherwise may never have had. Thus, if you're trying to conquer your fears you can gain exposure to something without actually putting you in physical space with that thing. So let's see if I can conquer my fear of spiders. Now, I'm not terribly afraid of spiders. They don't paralyse me with fear. Instead, they put me into action. I immediately find the closest paper towel or long, flat object and murder spiders. My pre-emptive attacks on spiders are purely because I don't want them crawling near me. Not in my yard, Charlotte. I knew spiders would affect me, but I also wanted to see if there was anything else I was afraid of, so I booted up A Fear Of Heights, AndOther Things. It basically creates a handful of scenarios, and is purely designed to show off the power of VR to create a natural fear response. A perfect choice for testing how afraid I was of certain scenarios. I tried them all. Heights was no big deal, even though I've told many people I'm slightly afraid of heights. This made me realize that I'm probably not afraid of the height itself, I'm more afraid of that feeling that one push could send me falling to my doom. It's kind of like that feeling you get when a train rushes by you on the platform. You feel its pure power and feel your pudgy human mortality. Sharks were also no big deal. I love Jaws, but I also know sharks are extremely misunderstood. That left the final two: claustrophobia and the dark. I went with claustrophobia first, and the experience feels like a cut tomb from Raiders Of The Lost Ark. There's a gold animal statue in front of you on a pedestal. I looked around at the room, which had no way out. I knew what was going to happen, I grabbed the gold animal anyway. Immediately, the walls started closing in on me from the left and write. "Neat trick," I chuckled. And then the walls started closing in quicker, and the torches were knocked off their perches on the wall. Closer and closer they got, and I could feel the squeeze. My body started to tense a bit and then – black. I was virtually dead. Then I had an extra 10 seconds and I felt like a fool because it wasn't real. I tried the dark next, which was even more effective. I was in a dungeon in front of a cell with a lighter. I could flick the lighter on and off, so I flicked it off and sat in almost-darkness. I looked around and saw there were some torches in the distance. A little shadow walked across the light it painted on the floor. Was that a rat? "That's some good detail," I tried to tell myself. "Nothing more." And then the door in front of me started banging and I almost crapped myself. I flicked the light on, then caught myself feeling foolish and flicked the light off. I ain't afraid of the dark – although there were weird grumblings coming from the sides of me. And it felt like they were closing in. With VR's fear-inducing ability confirmed, I turned to Fearless to try to cure my ills. When you boot it up, a pleasant man with a British accent calmly talks to you about how it's all going to work. He talks you through what's going to happen to warn you about the next scene, so you're not surprised. Once you press the A button, the scene will start and push your fear. It also gave me a number of fears I could solve. I chose everything except for cockroaches, because they're cockroaches. They're gross, not scary. In fact, it's actually kind of impressive, how do they survive so well – anyway, I digress. After choosing everything, I was given three options: bees, spiders, and cockroaches (I know). I went with spiders. Things start out slowly. You're shown a cute cartoon spider, and then you're shown a realistic drawing of a spider, and then you're shown a photo of the spider. It's at this point that Fearless drops some statistics on you. You're more likely to die from lightning than a spider bite in the US. Heck, Australia, a place that seems to fuel Americans' fear of spiders, hasn't had a death related to spiders in about 30 years. So, the app logically tells me, there really isn't any rational reason to be afraid of spiders. And then it starts. It puts a small little spider on the table in front of me – making sure to let me know that it won't come near me. Easy enough, though I already feel the urge to grab a paper towel. The next step brought the spider to me, and that's when I brought my head close to it to observe it better, as the app partly recommended. It consistently tells you that the more uncomfortable you feel, the more you should pay attention. Then things started changing. The small spider turned into a medium one, and then a huge one. Each time, I could feel the hair on my arms react just a little more. The app was tugging on something in me that alerted my instinct to murder spiders. Once I started getting used to the big spider walking around, I actually started to get fascinated by how its legs moved. This is another subtle trick Fearless plays on you. It tries to tell you interesting facts about the thing you're afraid of, like how spiders may design in obvious parts of its webs so birds don't accidentally fly into them. This is a truncated version of what I went through in real life with dogs. I was gently exposed to the dogs of my friends. Luckily for me, most of these dogs were rather calm and not excitable. So approaching them gently wasn't too bad. At the same time, the owners would tell me how nice and friendly these dogs were. Or how good a memory it had. Single spiders, no matter the size, were getting quite easy. That's when Fearless dropped the bomb on me: It put about five spiders of varying sizes right there on my desk. I felt like things were crawling all over me. I just wanted to take a huge plant and drop it on these crawlers. But I didn't. I sat there and fought against that urge, just like the app recommended. After that, Fearless dropped me into the final stage: A creepy, leggy spider would drop from the ceiling right in front of my face. While it was terrifying at first, I was mostly fine. I wasn't totally sure whether the effect was losing its luster or whether the app actually helped me be less of a spider serial killer. So I decided to turn to Arachnophobia. This app actually went viral back in 2016. It's a simple setup. You're in a room with spiders. There are five levels, and each subsequent level increases the amount of spiders in the room. First, there's a single spider in a glass jar. Then there's a couple. 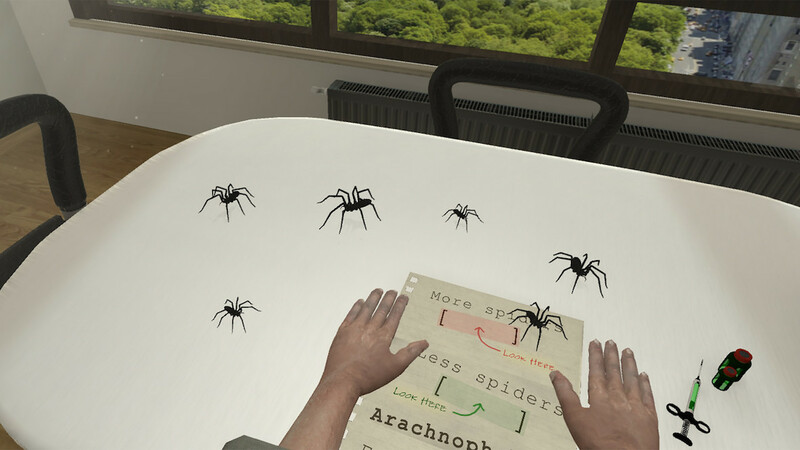 Then that couple is on the desk next to your virtual hands, and this is where Arachnophobia starts to freak you out. Your mind starts thinking that there's a spider near your hand, so when they rush up to your hand you want to move it – then you realise that there was nothing there in the first place. Either way, this works again and again. I plowed through the first three levels, but it was the fourth level that gave me pause. There were spiders right near my fingers, and I could feel that itch arriving again. The final level is downright creepy. The entire room is filled with spiders, from the windows to the walls to the desk. They are everywhere, and it genuinely feels like they're crawling – or will be crawling – all over you shortly. I remembered what Fearless taught me though, and I simply stayed in that creepy room until that creepy crawly feeling left. It did, and eventually I was feeling nothing. So, am I cured of my weird hyper aggression-based fear of spiders? Well, I haven't seen a spider in real life since I've done this, but I'm looking forward to seeing whether I rush to murder them, or whether I leave them be and not worry about whether they'll crawl all over my face, enter my ear and lay eggs that'll hatch and wake me up from my slumber with a thousand spiders flowing from my ear. While I can't say whether it worked for sure, it feels like it did. I feel like I'm less likely to react the same way to a spider the next time I see it. Fearless taught me some valuable lessons, and made me realise that my pre-emptive strikes are based on placing too much emphasis on risk that's barely there. The best way to put it is I think that if I react the same way the next time I see a spider, I'm going to pop into VR and get some more fear therapy. With my fears conquered, I think it's time to test out my resolve in another way. Can mobile VR replace my dependence on a cellphone out and about?